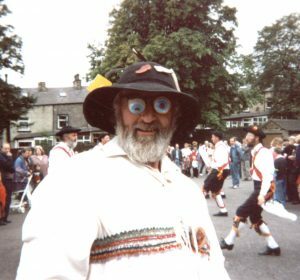 Northampton Morris men were formed in July 1949 to perform Cotswold Morris in and around the towns and villages of Northamptonshire . The kit at the time consisted of white shirt , white trousers with black shoes, but no hats.The side’s baldrics were red with large rosettes at the crossing front and back. The rosettes were yellow with a small red center. At the hips were more yellow rosettes with both red and yellow chevrons. The first squire was Ken York and the musician was Johnny Holeman. Northampton Morris Men became members of the Morris Ring of England in 1952. In 1953 black knee breeches replaced the white trouses. The famous Northamtpon “horse” first made its appearance in 1956 , this saw valiant service and was replaced by a new one in 1982 . For this year’s Golden Jubilee the “horse” will undertake a course of restoration. The side’s first fool was Malcom Purdy in 1957 wearing knee breeches , bells , short sleeved shirt , black hat and a straw wig. A later fool, Barry Newman is as shown below. The next change in kit took place in 1966 with the introduction of straw hats. However in March 1978 saw a major revamp in the kit. Black tricorns replaced the straw hats. New baldrics were made by Linda and Terry Dix with the same basic red colour scheme but with the addition of a thin yellow strip.That year also saw the appearance of the enamelled badges that are still worn, designed by Ian Phillips. 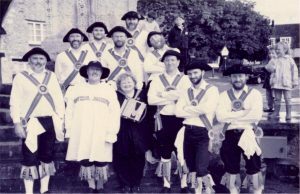 The side is now in its sixtieth year and still performs a variety of Cotswold dances including the more unusual Badby tradition. As was always the case, new dancers are very welcome, so click JOINING and come and enjoy!